Years ago, I lived in a small, drab apartment that didn’t feel like much of a home. One of the ways I made it a little more cozy and homey was to create a reading nook – a little space where I could curl up and read and tune out the world. I came up with the idea of a reading nook because I didn’t have much space and I wanted a little corner that only had one purpose. A space where I didn’t do work or pay bills or make irritating business phone calls. Sometimes I just want to turn off the TV, ignore my phone’s news alerts, sit down with a cup of something warm to drink and read. Whether you read, knit, work a jigsaw puzzle or just chat with a friend, this is a great way to feel like you’re a million miles from the outside world. You can go about this in many different ways. Your ideal nook may be different from mine. These ideas will get you started. Find a few square feet of your living room, breakfast nook, etc. Seriously, you only need about 5 feet for this. Ideally for me it would have a window that has a nice view of the outdoors, but that’s not necessary. Even a wide foyer or the end of a hallway can work. Give it a small table and a chair or two. If you need to buy furniture for this, check out your local Restore for Habitat for Humanity if you have one (you can dress up old, worn furniture with Contact Paper for tables and throws for chairs). They sell used furniture, and the money goes to a very good cause. There’s also Ebay for furniture. And you can find great deals on Amazon for end tables and chairs. Another option: put two short, matching bookshelves opposite one another, front facing outward. Balance a large block of wood over them. Now you have a table that shelves books or magazines or your bag of knitting or whatever you want to do here. Put a good reading lamp on the table, and some coasters for drinks. I’m partial to an Ott Daylight LED lamp – I actually have three of these around my home, because the light is just that amazing. But there’s also this model with craft storage. And if you have the room, a floor lamp is another option, leaving you more table space. If you already have bookshelves in your home, another option is to simply put a chair and an end table near them. You might want to keep a throw on the chair for cool evenings. For those of you who like to read electronically, you might want to get a Kindle or iPad holder. This might also be good for those of you who want to use your nook for knitting, and have some streaming music or video from your device. 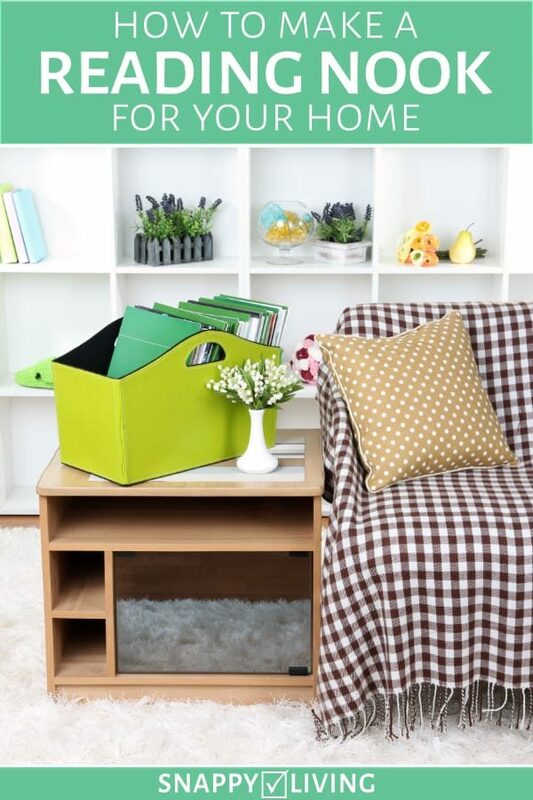 A storage ottoman is great for both putting up your feet and keeping magazines or knitting supplies handy yet out of the way. If you have back or neck pain, consider adding a shiatsu massage cushion to your chair, and let your muscle tension melt away while you relax.